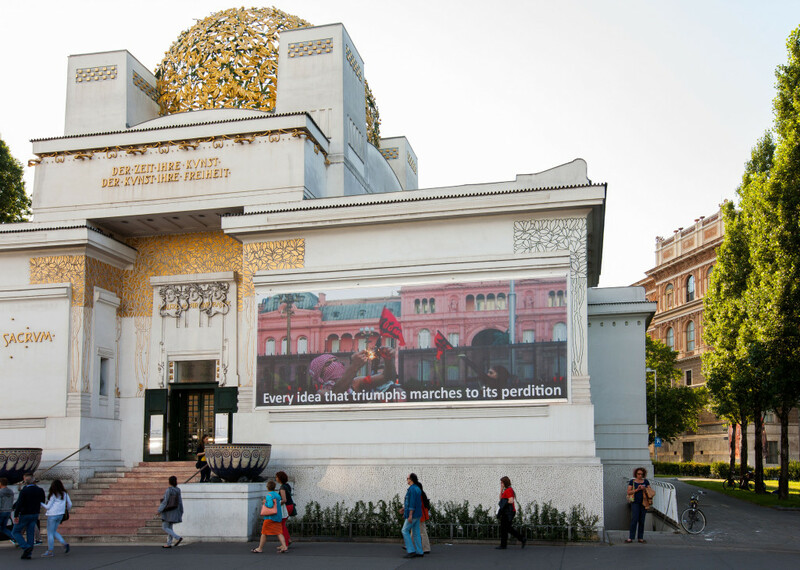 While the exhibitions Utopian Pulse – Flares in the Darkroom are on view, large banners created by the artist-curators will be displayed on the Secession’s façade in weekly alternation from September to November 2014. Urgent Alternatives: Utopian Moments is part of the exhibition Utopian Pulse – Flares in the Darkroom. 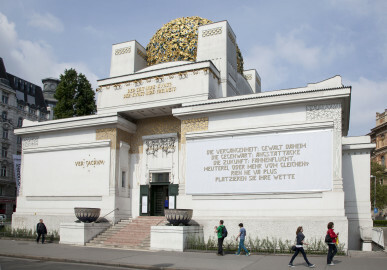 In the run-up to the exhibition series, seven large-format banners will be presented on the Secession building’s façade between February and September 2014. The uprisings, occupations, and social movements that have emerged in the past several years constitute the unifying theme of Urgent Alternatives: Utopian Moments. Utopian thinking has recently made a comeback powered by a new sense of urgency. Because the idea that things could just go on the way they have really is wishful thinking. Banner created by Pedro G. Romero and Máquina P.H. The Immigrant Space is an occupied building that works as social center and housing in Raval, a neighborhood in downtown Barcelona. The social center focuses its work on creating spaces of debate and empowerment by and for people whose rights are restricted by immigration law. Basic services such as health care, legal advice and language classes are also provided, with a strong emphasis on autonomy and civil disobedience. The space is open for organizing screenings, talks, and activities that aim to collaborate in the struggle against racism, classism, xenophobia, patriarchy, and paternalism. Daniela Ortíz’s work aims to create spaces of tension where conceptions of race, class, nationality, and gender are explored in order to foster a critical understanding of the structures of inclusion and exclusion in society. In the past several years, she has developed several research projects mainly focused on domestic labor in Peru and migratory control systems in Europe and United States. Many of her projects have been developed in collaboration with Xose Quiroga, with whom she coedits the independent news medium Antigonia.com. Daniela Ortíz was born in Cuzco, Peru, in 1985. The World is Flooding, takes Mayakovsky’s free-to-use play Mystery Bouffe* as both structure and starting point for collective works in which the figure of the Eskimo has been developed as at once a whistleblower, a messenger, an innocent child forming an early comprehension of the system and a newcomer experiencing a new environment for the first time. The figure of the Flood came to represent that which is ‘too much’; too many feelings, too many demands, too many traumas, while the Boat is a saving device which, alas, is liable to be taken over by the privileged. The World is Flooding-zine is free and available to download as a PDF on request from info@oreetashery.net and was done in collaboration with Freedom from Torture, UKLGIG, Portugal Prints, and Tate Modern. Oreet Ashery is a London based, interdisciplinary visual artist. Her practice is socially and politically engaged and often takes place in public spaces and tends to include participatory and interactive elements. The Errorist action B.A.N.G was carried out in Buenos Aires during demonstrations celebrating the anniversary of the uprisings of December 19–20, 2001, which were significant utopian rehearsals. The picture is a metaphor of the ending of the cycle of social uprisings and revolts and the beginning of the so-called “normalization process”. This proceeded in stages, undermining the utopian nature of what developed in 2001, when the country experienced a deep crisis of representation. On the background, the Casa Rosada, the Argentinean government building, is guarded by fences and police, while Errorist cells staged actions to highlight this “normalization” and what it involved; most of all the application of an anti-terrorist law to control and criminalize the social protests. Composed of visual artists, poets and actors, the collective Etcétera was launched in Buenos Aires in 1997. They bring art to where social conflict is born, in the streets, and then carry this conflict into the arenas of cultural production, including the media and art institutions. The banner is based on a series of posters that were produced during the general strike of the Indonesian Labour Union in 2013. The labour union demanded the rejection of low wages, social security for the people, and a ban on outsourcing. The strike failed to meet its demands, but the union still struggles for its demands. Nobodycorp. Internationale Unlimited was founded in 1993 by Alit Ambara, an artist and activist of the Cultural Network (Jaringan Kerja Budaya) in Jakarta. Nobodycorp. became a label of bodies of works that resulted from ideas, discussions, and thoughts from the Cultural Network. Historically and culturally, Taksim Square is Istanbul’s beating heart, the center of the city; a meeting point both for tourists and locals. On May 1 each year, International Worker’s Day, hundreds of thousands gather in the square and march down Istiklal Street waving their flags and banners. Since the 1970s, Taksim Square has been a platform for people for protesting and each time, the empty façade of the AKM Cultural Center became a canvas for protesters’ banners and posters. The square was also the site of the 1977 Taksim Square Massacre, when several political groups clashed leaving thirty-four dead and many others injured. On May 31, 2013, when a few of Gezi parks’ trees were cut down and the police attacked the peaceful protesters, the Gezi protesters put up their banners against the government and their urban transformation project on the façade of the AKM. The neighborhood of Sulukule, which for six centuries hosted the Roma population of the city, has been demolished as a part of an urban transformation project in 2006. The kids of Sulukule, who named their hip-hop group Tahribad-ı Isyan (Rebellion or Destruction), voiced the anger, resistance and hope of not only their population but also of the people of Istanbul. In this photo, their mouths are shut, but the AKM’s façade speaks. 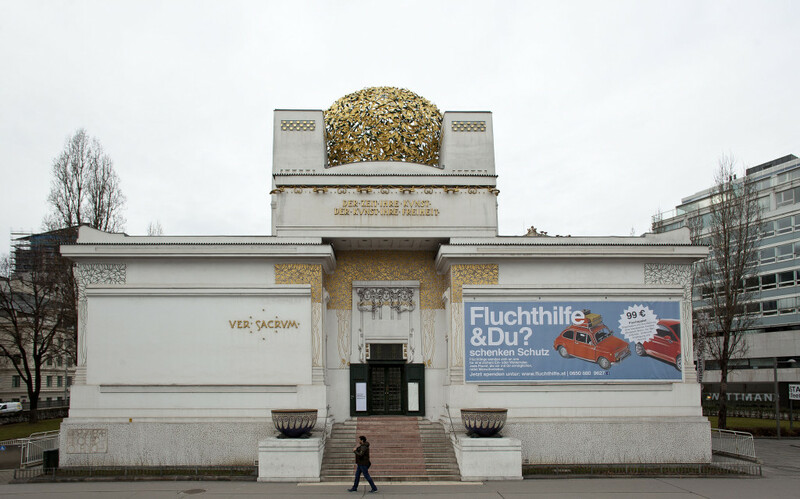 Fluchthilfe & Du addresses the critique of the EU border regime and its migration policies expressed by the self-organized refugee protest movement in Vienna. The design of the banner, titled Fluchthilfe & Du? (Escape Aid & You? ), echoes a current campaign by the Caritas, which collects donations with an appeal to charity while distancing itself from those it denounces as “human smugglers”: people whose assistance to refugees made it possible for them to come to Austria and apply for asylum in the first place. Fluchthilfe & Du envisions aid to refugees as a service and publicly solicits support for their struggle for freedom of movement. The work was created as an act of solidarity with those activists of the refugee movement who have been held in custody since July 2013 and accused of being members of an international human smuggling organization. The charges—they supposedly made millions and endangered the lives of refugees in transit—have been rebutted, but the Austrian interior ministry continues to criminalize them.